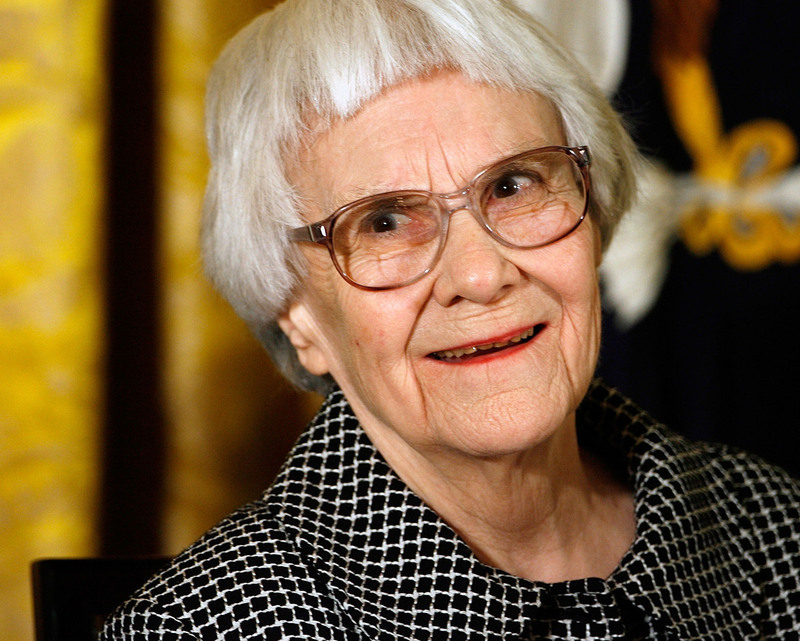 Book News: Harper Lee Says Literary Agent Exploited Her Health : The Two-Way Also: Historian Niall Ferguson apologizes for John Maynard Keynes comments; the best books coming out this week. Harper Lee smiles before receiving the 2007 Presidential Medal of Freedom at the White House in Washington, D.C.
Harper Lee is suing to recover royalties from her former literary agent, Samuel Pinkus, who she claims tricked her into signing over the copyright to her novel To Kill A Mockingbird while she was recovering from a stroke in an assisted-living facility. The 87-year-old author regained the rights in 2012, but says Pinkus has still been collecting royalties. Cue the where's-Atticus-Finch-when-you-need-him jokes. Harvard historian Niall Ferguson has apologized after suggesting that John Maynard Keynes' economic theories were influenced by the fact that he was gay and childless, and therefore was unconcerned with the welfare of future generations. He wrote, "First, it is obvious that people who do not have children also care about future generations. Second, I had forgotten that Keynes's wife Lydia miscarried." Ferguson tends to court controversy — his 2012 book Civilization: The West and the Rest was widely seen as an apology for Western colonialism. "The discerning reader has long grown weary of dead and dying stereotypes of the modern African novel: Civil wars. Black magic. Vulture-stalked refugees." --Nigerian author A. Igoni Barrett, writing for NPR.org, on why Ahmadou Kourouma's novel Allah Is Not Obliged defies stereotypes. The late Chilean poet Pablo Neruda had advanced prostate cancer, according to a preliminary forensic test. Neruda's body was exhumed last month to determine whether he died from natural causes or, as has been alleged, was poisoned after a 1973 coup that overthrew his friend and ally, President Salvador Allende. More tests will be required to determine the actual cause of death. In Ben Percy's Red Moon, the U.S. government comes into conflict with a repressed minority — the "lycans" (werewolves, essentially) — in a muddled metaphor for the U.S.'s fraught relationship with Arab-Americans, gays and blacks. Ultimately, Red Moon is an excellent monster novel, but a just-OK piece of social commentary. Janet Malcolm's latest collection of essays, Forty-one False Starts: Essays on Artists and Writers, includes, among more "serious" works, her great piece on the subtle brilliance of the "strange, complicated" and "transgressive" Gossip Girl books (like several other essays in the collection, you can also read it at The New Yorker).